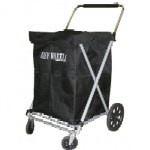 Swivel front wheels make this folding cart very easy to maneuver AND has height adjustable handle! The height adjustable, Canvas Swivel Cart by EasyWheels can be used for shopping, laundry or for transporting heavy or bulky items. It is easy to imagine this cart as a very functional shopping cart but it can also be utilized as a laundry cart. Use the canvas bag as your dirty clothes hamper, wheel your cart to the laundry room and when finished, fold and lay your clean clothing on the top of the cart's cover and roll home. Swiveling wheels make such a difference with these folding carts. This cart's four inch diameter, ball bearing front wheels swivel to make rounding corners and navigating aisles easy as pie. The canvas bag on this cart is very heavy and water repellant. The cart bag is 23 inches tall, 15 inches deep and 15 inches wide. The bag cover fits over the bag snugly and attaches tightly with hook and loop closures in the front and both sides and the back. The bag also has canvas handles on both sides for easy removal. The cart is functional without the canvas bag as well; use it to haul difficult to carry loads. The handle on the canvas swivel cart is height adjustable with three height settings - and it is EASY to adjust too. The height can be adjusted a full eight inches from 32 inches (from ground to handle) up to 43.5 inches. The handle has a soft, foam grip. This cart can be easily folded for storage. It folds flat except for the rear wheels which are nine inches in diameter. The folded cart will fit into any space larger than nine inches wide and 35 inches long and 21.5 inches deep. It will fit easily into the trunk of your cart or even the backseat. Easy assembly - the only tool needed is included with the cart. Easy to read instructions along with a parts inventory list are printed on the backside of the box. There is no possibility that the cart will arrive without assembly instructions. 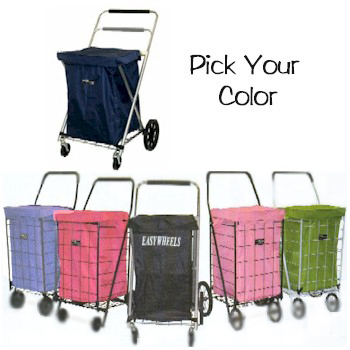 The cart is available in SIX GREAT COLORS!. Black, Navy, Fuschia, Lilac, Apple Green, Pink.